Making guitars is a very enjoyable way to spend time. 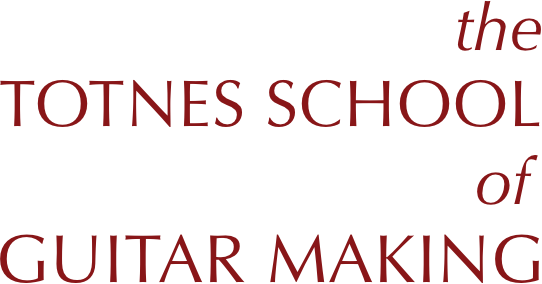 The Totnes School of Guitarmaking trains people to work to a professional standard, and about half of our students come with the express intention of working with instruments professionally, whether repairing, making or a combination of these. (A selection of these can be found on the Past students page.) It is a good idea for anyone contemplating this to have certain bits of information to hand, about the practicalities and, most particularly, the economics of taking this path. Like every other art or craft, guitarmaking is rewarding, satisfying, personal and oversubscribed. Because lots of people want to supply beautiful, individual, expensive guitars relative to the number of people who are anxious to spend their money buying one (or more), the price of the finished goods is driven right down. It is certainly always lower than the work deserves - whether by a new aspirant or an experienced craftsman. There are ways around this. They all start with being informed: gaining a realistic view of the market and the type of workshop to be set up. Then they range. There is a basic, I might say universal, acceptance that satisfaction and enjoyment are part of one's earnings. Unlike the banknote part, these do not pay bills - though they certainly increase quality of life. The difficulty in making hard currency out of guitarmaking falls heaviest on new makers. Without a track record, or reputation attached to their very name, the balance of income is likely to be much satisfaction, and much less cash. So some means of living has to be found, and also means to advance professionally. There are probably as many ways of dealing with this conundrum as there are people doing so. In between the sole trader and the large guitar manufacturing establishment there is repair work, other (often related) business occupations, the pursuit of replicatable (and therefore licenceable) guitar-products, private incomes and simple hard work in guitarmaking ventures of every size and orientation providing extra financial strength. The underlying problem is constant. It should not be taken to mean that making a living in the long run is impossible. It is not. It is simply difficult, as with every other art or craft. As said above, half of our students come with the express intention of becoming professional makers. Of these, about three-quarters initiate a workshop or find guitarmaking work in other ways, and between a quarter and a half become established in business for the long term. Turning from economics to the making itself, there is the last, and most important point. I believe we are living through a golden age of instrument making; that it will come to be seen as such. The natural inventiveness of makers, the pressures of the market and the huge part that music now plays in life have brought this on. From copies of early instruments that frequently equal or surpass originals, to exquisite workmanship in the best mainstream instruments and unrelenting experiment and innovation on the fringes. Making music is one of the wonderful human urges. Making musical instruments, particularly by hand, is tucked in there with it - part of it.